He must be carrying an umbrella. I am sure that is a special type of umbrella that goes by a Malayalam word, but I am not sure what that is. I have also usually seen him with a mustache and pot belly, that always, always, always is bare (unlike Santa's). Maveli wears traditional Kerala men's attire - the mundu around the waist and one draped like a kind of scarf around his neck. Regarding the jewelry - neckaces and wrist- others can fill us in on that. The thread along the belly from sholder to waist must also be symbolic. On the signboard above, there are also two tigers drawn, one at each bottom corner. This represents pulikali. Puli means tiger, kali means play. People dress up like tigers.They react scenes of tigers being caught by humans. 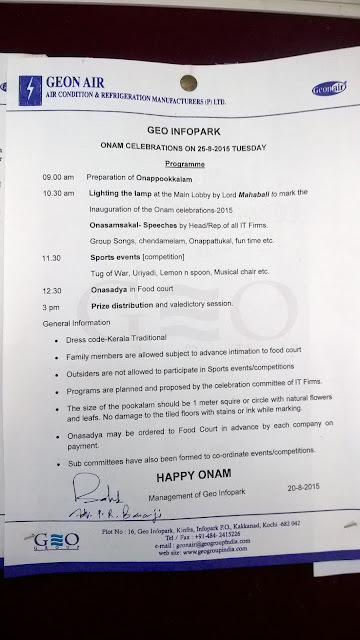 So, what is Onam? 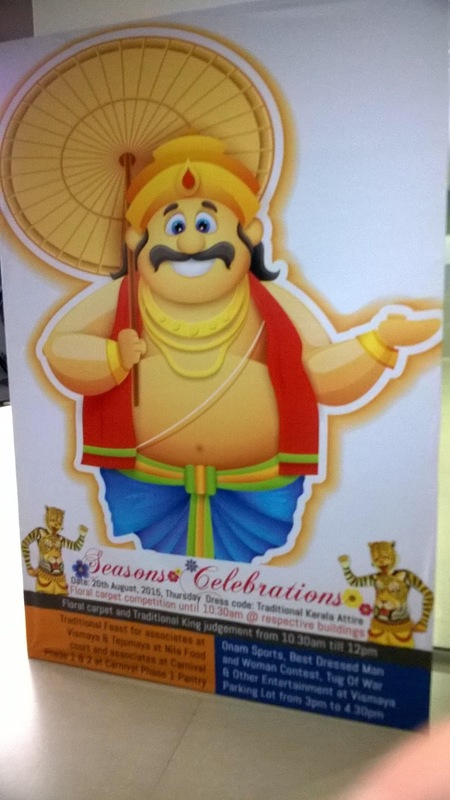 Onam is a holiday unique to Kerala and Keralites in India. 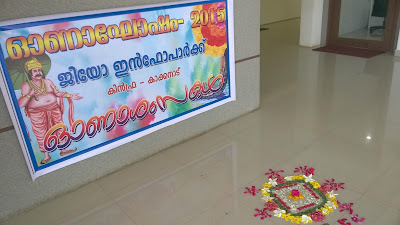 If you work with an offshore development team or BPO in Kochi, Ernakulam or Kakkanad (Infopark), I would like to show you a few photos of how some of the companies and community prepares for Onam. 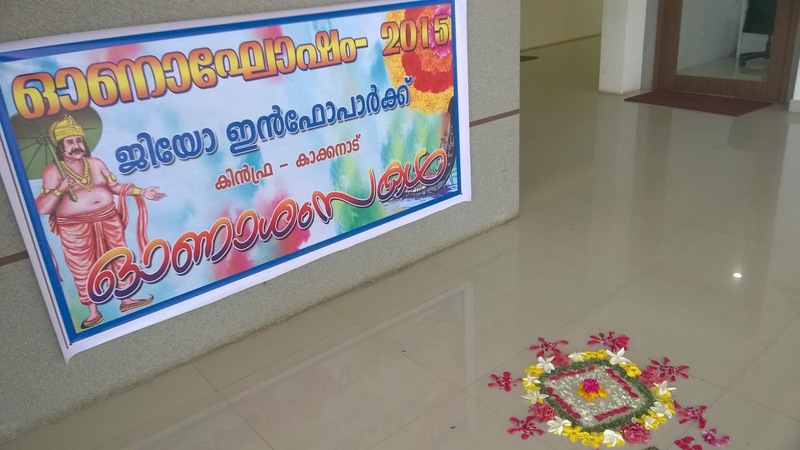 The purpose of this post is mostly to share images of community decorations and preparations. 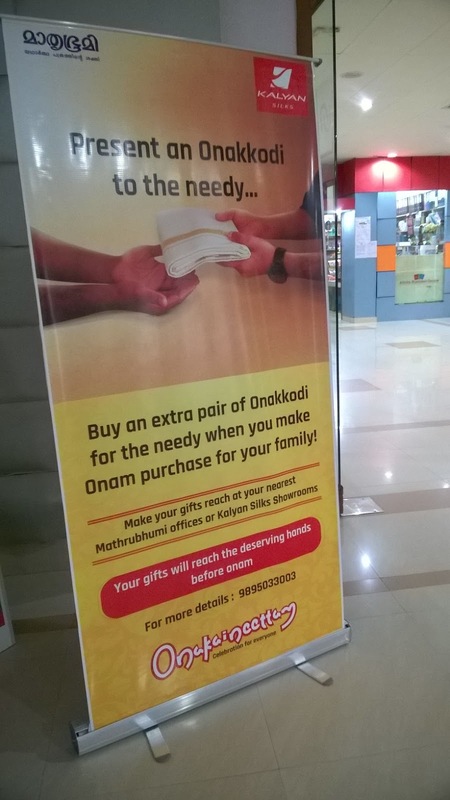 If you would like to read about the actual celebrations, click here, or the story of Onam, click here. This is an offering (neetam) by hand (kai) done on the occassion of Onam. 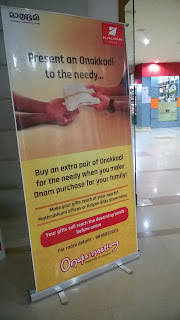 This poster asks us to donate clothes for the needy. 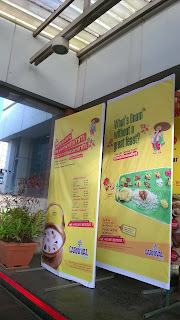 There are also rice donation spots, which go by a different word in Malayalam. Sadya is the name of the feast with over 30 curries served on a banana leaf. Now a days, many families may order sadya instead of cooking at home, as there are more nuclear families. Onam is the season for a whole bunch of kinds of payasam. 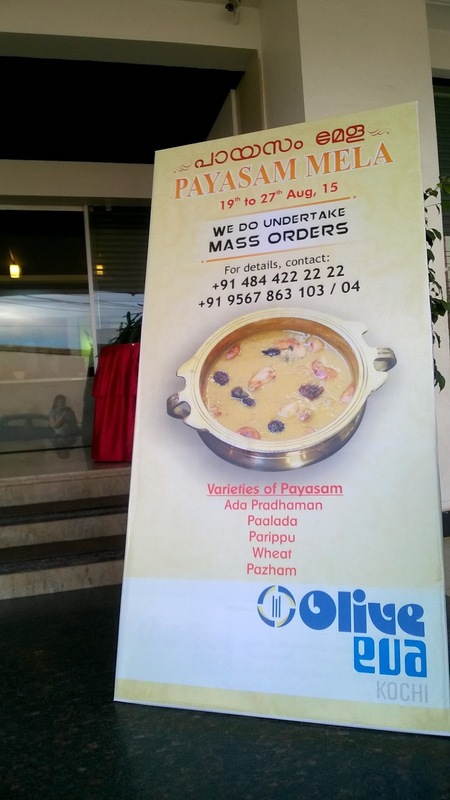 Payasam is a milk based pudding made of different rices or pulses with fruits or nuts added. The public announcement is posted on the building's bulliten board in the reception area. Let's see what are the items on the agenda. Traditional drummers of Kerala. This is usually done during Varavelpu, or the entry of Maveli. A person holds a stick with a clay pot attached to it. Partygoers are blindfolded and given a stick until one person hits and breaks it. To make it more interesting, the person holding the stick with the pot to be broken, moves the stick around creating confusion for the person trying to break it. When the pot breaks, water is showered on the lucky pot-breaker! This is a team event, where each member has to run a course with a spoon in their mouth, balancing a lemon. Something missing from this list, but I'm looking forward to seeing is thiruvathira, the traditional Kerala dress for ladies. 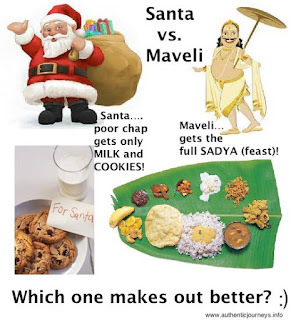 Santa gets milk and cookies, while Maveli gets a 30 course meal! See the fun comparison of Maveli and Santa in the image below. Jennifer Kumar works with distributed and global agile software development teams to communicate more impactfully across cultural borders. Check out training and coaching programs here. When is Onam and other Indian and American holidays in 2016? Labels: Move to and Live in the U.S.